This is a major new release. It has all of the important features of PowerSDR now EXCEPT RX2 panafall display, and it has many new features that are not available in PowerSDR (see below). Thetis is arguably not beta anymore! And, just to be clear, no, there is no RX2 panafall...yet. Expect that for next release. "P2" firmware is still very much in beta and may or may not work well on your radio. There are many changes in this major update of Thetis. • VAC1 startup problem fixed. • VAC2 resampler problem fixed. • Option to use VAC2 on split. • Speedier TX-RX and RX-TX transitions on phone (improves latency by at least 10ms). • New default database values (DATABASE RESET HIGHLY RECOMMENDED—see below for more information). • Substantially improved QSK features and performance. FULL QSK is now possible on the 7000DLE, 8000DLE, and 200D hardware. (REQUIRES Protocol 2 firmware—see below for more information). • Substantially improved VOX/DEXP features and performance (see below for more information). The default values in earlier versions of Thetis were based on those in PowerSDR mRX PS, which have not been updated in a very long time. These defaults were based on much older, much less advanced versions of software and hardware. As such, they were long overdue for updating themselves. Starting with this version of Thetis, there is a completely new set of default values that should help new users be more immediately productive and enjoy a better, "out of the box" user experience. PERFORMING A DATABASE RESET WITH THIS VERSION IS HIGHLY RECOMMENDED. • Make screenshots of important or complex settings, for instance amplifier calibration values. • Use Setup > Transmit > Export Current Profile to export important and/or complex transmit profiles. • Use Setup > CAT > Configure MIDI > Manage Mappings > Export Mappings to export MIDI settings. For each transmit profile exported it can be imported using Settings > Import Database. It will require a separate import cycle for each profile. You will most likely want to re-save each profile to pick up the additional VOX/DEXP elements that will now comprise a part of the transmit profile. WARNING: transmit profiles also modify the settings in Setup > DSP > Options. If may want to review those settings after importing a transmit profile. Recommended settings are a Filter Type of “Low Latency”, Filter Size of 4096, and Filter Window BH-7. MIDI settings can be imported using the “Import Mappings” function that was adjacent to the “Export Mappings” function referred to above. • ANAN-7000 (all versions) or ANAN-8000: Protocol 2 firmware version 1.7 or later. • ANAN-200D: Protocol 2 version 1.6 or later. A new button labeled QSK appears in the CW sub-panel of the main console when operating in CW modes (CWU or CWL). If the Protocol 2 firmware version currently loaded in your radio is older than that required (see above), the QSK button is disabled. With QSK (sometimes called “full break-in”) enabled, receiver audio can be heard between CW elements (dots and dashes). This enables monitoring activity while transmitting. It's very useful when working a split-frequency or simplex DX pileup, operating in a contest, or any time the ability to hear what's going on while sending is desired. • Semi break-in mode is enabled, and its delay is set to zero (0). • Since Thetis MOX is not active in QSK (necessary for quick response), there is no transmit spectral displays and NO TRANSMIT METERING. Simply turning off QSK will resume the display and metering of normal transmit behavior, either with PTT or semi-break-in. When the QSK button is clicked to disable QSK (or when changing to a non-CW mode, including when this happens as a result of clicking a band button), everything is set back to the way it was before QSK was enabled. While operating QSK, the sidetone level becomes tied to the monitor level, which can be set in the Setup > Transmit, monitor sub-panel, with the control labeled "TX AF". Since it is a separate control from the receiver audio, the sidetone can be adjusted to be louder or softer than the receive audio according to preference. The setting remains in effect until QSK is disabled, at which time it returns to its previous value. TX AF levels will then switch back and forth between the QSK and non-QSK setting depending on the state of the QSK button. With QSK on your own signal is heard in the receiver while transmitting. When operating with a single VFO (i.e. not split) the tone heard is identical to the CW pitch setting, since that determines the transmitter offset in CW when in tranceive mode. Depending on the sidetone volume, it may be possible to distinguish between the two tones due to a slight time difference between them. If the transmit frequency is moved slightly away from its transceiver offset, either by changing RIT/XIT or tuning the transmitter off frequency a bit using split mode, both tones will be clearly heard at different frequencies. • Slope 5, Max Gain 100, Decay 1, Hang 12. 1. Although semi-break-in can be manually enabled with a delay of 0 without QSK, this results in something less than true QSK. It will work but nothing will be audible between CW elements unless sending very slowly. The new QSK mode makes use of the AGC Custom mode setting and increases the AGC hang threshold to a high enough value so that AGC hang doesn't blank out the receiver between CW elements. 2. The key-down delay (Setup > General > Options) is now limited to permit a setting no shorter than 7ms to ensure a clean CW signal. Setting it lower than this would cause key clicks to be transmitted due to keying the CW signal before the relays have fully engaged. This is not healthy for the relays, and other operators on the band will not appreciate the resulting key clicks that are produced, which may extend up and down the band for 10s of KHz. Some external amplifiers may also need a longer delay, although this setting should work with most. Check your amplifier’s manual and timing requirements before using its QSK capability. In the other direction, increasing key-down delay longer than about 10ms reduces the time available to hear signals between CW elements, defeating the purpose of QSK. Likewise, key-up delays longer than a few ms is unnecessary and you likely will find that the minimum of 1ms works fine. 3. When in QSK, the usual cycling of the MOX function in Thetis doesn't occur. 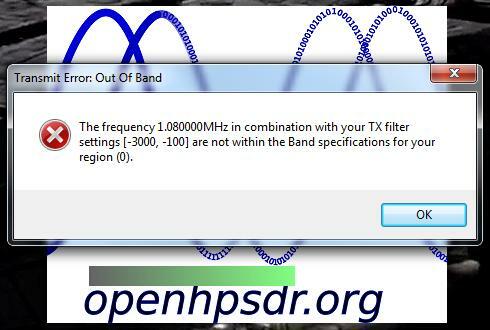 As a result, checking for band boundaries doesn't happen and will not prevent you from transmitting out of band. Use caution! Prevention may come in the next release. Up until now the VOX gate and the downward expander/noise gate (DEXP) have been two different audio processing stages. They were largely redundant and not very adjustable. In particular the VOX was rather unsophisticated and not well disposed to natural sounding voice. With the advent of the new, high performance audio processing facilities in PowerSDR 3.4.1 and then in Thetis, this was the final remaining area for improvement in the audio processing chain for phone operations. The primary goal for this change was to provide studio quality noise gating and downward expansion, and thereby obtain smoother, more reliable operation and much more natural sounding voice quality on the air. To that end there are a lot more adjustments available, a delay line to avoid first syllable cut-off, and a couple of features designed to eliminate VOX activation due to background noises. These adjustments can be left at the default setting, all set to minimum numbers with DEXP turned off for an old-fashioned, hard-edged VOX, or adjusted to obtain the performance desired. Used properly, and with judicious adjustment, people may not even realize you are using VOX! • Mic input: the VOX/DEXP block is located after Mic Boost and before Mic Gain and all other audio processing. • Line input: the VOX/DEXP block is located before Mic Gain and all other audio processing. • VAC input: the VOX/DEXP block is located after VAC Gain and before all other audio processing. • Anti-VOX taps receiver audio after RX1 AF and RX2 AF controls, but before Master AF or VAC RX Gain. • Both the VOX and DEXP threshold control are now combined into a single slider widget that provides audio level metering indications against the selected threshold. • The DEXP slider widget is no longer required. • VOX and DEXP controls are now located together in Setup > DSP > VOX/DE. • VOX OFF, DEXP OFF—no PTT action, no gating or downward expansion. • VOX ON, DEXP OFF—PTT action, all gating functions operating except for Expander Ratio (Exp. Ratio), which is effectively set to infinity (a pure gate, no downward expansion). • VOX OFF, DEXP ON—no PTT action, all gating and expander functions operating. • VOX ON, DEXP ON—PTT action, all gating and expander functions operating. • VOX threshold is adjusted with the slider control on the main console user interface in the same manner as previous versions of Thetis. Approximately 15 to 20 dB above normal background noise levels is a good starting point (not including receiver audio; see “Anti-VOX” below). • Attack time—after being triggered open the gate gain increases from fully closed to fully open in this amount of time. This adjustment can help soften the start of audio for a more natural sounding result, it is typically kept short for radio applications. 2 ms is a good starting point. • Hold time—after being triggered closed the gate gain will stay fully open for this amount of time. This is most closely analogous to the old VOX hold time. If re-triggered open this timer resets. Adjust as desired, typical values range around 250ms, which is also a good starting point. • Release time—after the hold time expires the gate gain decreases from fully open to fully closed in this amount of time. With VOX enabled, PTT releases after this time expires. It can be made longer for a more natural sound, especially when not using VOX, or made shorter for contest or VOX work. Typical values range from 10ms to 250ms. 100ms is a good starting point. • Det. (detector) Tau—the amount of time the input audio must be over threshold before the gate is triggered open and, with VOX activated, PTT asserted. Making this longer can help filter out extraneous background noises from triggering the gate, such as typing on a keyboard, but it does increase gate latency. 10-20ms is a good starting point. • Anti-VOX—this feature raises the VOX threshold in real time in concert with receiver audio levels in order to prevent receiver audio emanating from speakers from tripping the VOX threshold. Anti-VOX is not required when using headphones, of course. Note: this is not “noise cancellation”, only an adjustment based on sound level. • Anti-VOX Gain—this is the gain factor used to cause VOX threshold adjustments in concert with receiver audio volume emanating from the radio speaker(s). This value can be positive or negative. Set the value as low as possible but high enough to prevent receiver audio from triggering VOX. It generally helps to set it very low, say -40dB, then work up from there. For average listening levels and RX1 AF or RX2 AF set to 100, a value of -20dB is typical. If the VOX threshold is set using a quiet room (fans and other equipment, but no receiver audio), adjustment in this manner should still allow triggering VOX even when receiver audio is active, e.g. when trying to break into a DX pile-up. • Anti-VOX Tau—this sets the time constant of the low pass filter applied to the Anti-VOX gain algorithm. Smaller numbers make Anti-VOX more responsive to receiver audio at the expense of making the Anti-VOX gain setting more sensitive (aka “touchy”). 20ms is a good starting place. • Use VAC Audio—when not checked, Anti-VOX will use both RX1 and RX2 audio (nominally for people using speakers attached to radio hardware). When checked, Anti-VOX will use the audio present on active VAC outputs (nominally for users who are fully “virtualized” i.e. remoted from the hardware). • Side-channel Trigger Filter—when enabled, the actual audio used by the gate trigger detector will be filtered by the combination of the low and high cut filter adjustments. This does NOT affect the audio passed through the gate and sent out over the air, which remains unfiltered. Along with the Det. Tau adjustment, the side-channel filter can be extremely helpful in eliminating false triggers caused by keyboarding, bumping or moving the microphone around, cats jumping on the desk, etc. Adjust this to match up with the dominant frequencies of your voice. A low cut of 500Hz and a high cut of 1500Hz is a good starting point. • Audio look-ahead—this adjusts a delay line such that the VOX/gate trigger decision can be made on a first syllable but that first syllable will not be lost because the gate acts on the audio coming out of the delay line. For best results this setting should be greater than the sum of the Det. Tau setting AND the RF Delay setting (in Setup > General > Options) PLUS 10ms. Used properly, people may not even realize you are using VOX. The downside is that there is some latency so it may not be the optimum choice for contesting or the like. Proper adjustment depends on how quickly you speak, but a good starting place is 60ms. • Hyst. (hysteresis) Ratio—to prevent rapid triggering/un-triggering of the gate this is the difference between the threshold for triggering the gate open or closed. 2dB is a good starting point. • Exp. Ratio—this is the only expander adjustment, and this is the slope of the audio gain line from the gate threshold to fully closed. For a hard, "pure" gate, this can be made equal to 30dB. A more typical value would be 10dB which results in a 10:1 slope (fairly steep). For those who prefer a softer, more gradual transition (usually those who are not using VOX, maybe someone who just wants to suppress background fan noise), this can be made very gradual. For example a value of 3dB will provide a 2:1 gain slope. Thank you for the detailed summary Scott. I had a chance to play around with version 2.6.4 last night and it behaved beautifully. I would echo your comments about starting with a clean database. Being adventurous, of course I tried Importing my existing database from Thetis version 2.6.2 and that did not work out well. As you said, there are a lot of changes and additional features as well as changes to the on/off addressing for features. After starting up with a clean database I imported all my TX profiles from Thetis v2.6.2 (one at a time) without issue, although there was an unhandled exception that occurred at one point. I hit the ignore button and then re-attempted to import the profile where it happened and it went in fine. Note that the custom skins that I have made for Thetis will not display the QSK button in the CW form and also some of the skins are missing the RX Ant button at the top of the GUI. Doug contacted me to give me a "heads up" about the new file names so I will update the skins early this week to correct the missing buttons. Those who use the custom skins can download the full skins or simply unzip the updated button packs into the Console folder and that will take care of it. I'll put a note on top of the skins page at http://www.w1aex.com/hpsdr/hpsdr.html when the updates are in place. One quick question: Is there a Protocol 2 firmware version 1.6 for the 200D? I looked around but did not see that available for the 200D. It seemed like version 1.5 worked fine but I did notice that the QSK function and the RX Ant function did not seem to be available. Again, thank you for the detailed update summary. Last edited by W1AEX on Sun Apr 14, 2019 4:20 pm, edited 1 time in total. We are endeavoring to have the firmware posted to the repo at this time. Last edited by geireri@online.no on Sun Apr 14, 2019 3:07 pm, edited 1 time in total. Rename the entire "Thetis" directory to "Thetis Backup" (or something like that, or delete it, but renaming allows you to go back). This will cause Thetis to start over from scratch. See if that works. A database reset was recommended in the release notes. DL8LAQ wrote: Ups! There is something wrong with the relais offset. VFO A jumps 600 kHz up if PTT is pressed for a few seconds... Do it a few times and you will reach the end of band set in XVTR menu. What is "relais offset"? I'm sorry that I know very little about transverter operation. Transverter functionality was reported elsewhere as being OK.
Did you start with a completely reset database as the release notes recommended? -/SIMPLEX/+ appears in FM mode. 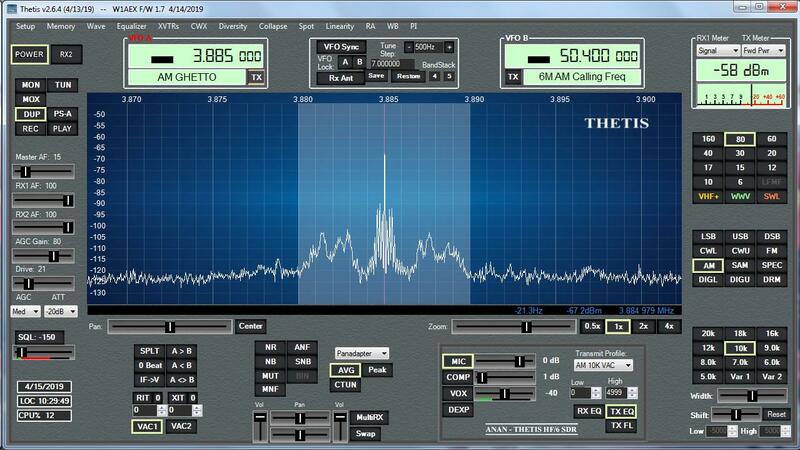 Offset -600 kHz is used in many european countries for fm repeaters, in german called "Relais". If I do a database reset I get a warning msg "61.44 Mhz bla bla" at every band change. So I used the old database, ignored the 61.44 MHz warning, and could use the new version. Thanks Scott. Looks like firmware version 1.7 for the 200D just arrived (Thank you Rick - N1GP!) at the GitHub repository so I'll be installing that in a few minutes. Changing the "Power" button to "Run" and "Stop" is a good idea. I'll add that to my short list of things to do. Hopefully, we will have a few rainy days this week that will keep me from "yard duty" so that I can take care of that sooner rather than later! Thanks again for the excellent summary for the version 2.6.4 Thetis release. From what I have seen over the past couple of hours it's running great! The new release is awesome. I have my sampling rate all the way up and no glitches. also buffer size at 128. I could not get this before. I did go into the code and added a few items mainly a drop-down menu that allows you to select "bypass" for the filters. Also, when you select "WB" the #1 Band Pass filter bypasses automatically, only one needed. Of course I removed the "setup" selections as they are now on the drop-down menu. I also added some visual aids on the "collapsed screen - values associated with track-bars. Not sure if any of these items are of interest, if so I can send these to Doug as I have noted the changes in the code for easy location. Thanks to all for the great software updates, Thetis and Proto #2 firmware. Nice Joe, when will other be available to look at your compile? Just a quick note that all the skins on the download page for Thetis and OpenHPSDR have been re-packed and uploaded at this time. They are now fully compatible with Thetis version 2.6.4 and all the buttons and sliders should display correctly in both the Expanded and Collapsed GUI modes. For those who have older custom skins installed you can either download the full skin and unpack it right over the old one in the Skins folder, or you can simply grab whatever button pack you wish to install (located near the bottom of the page) and unpack that right into the Console folder of your previously installed skin. Either way will work fine. Same here. I tried twice with a clean install! If possible I could send to Doug for availability to anyone. I want to be sure everything is ok for anyone to use without issues regarding proper distribution. As far as the program functions, everything works fine. Did you delete or rename the specified folder? As I recall, when I changed my text size from the Default value (100%) in the Windows display settings I saw a string of Console errors that looked like that when I tried to start up OpenHPSDR. I wonder if the same thing happens with Thetis? Is there any chance you guys are running either the Medium (125%) or Larger (150%) text size setting? Hope it is as simple as that. Thank you so much for your input Rob! I have set to 125% scaling, but unfortunately no difference if I change neither up nor down. I'm getting an "unhandled exception" on close of 2.6.4 frequently. I click the "Power" button, then click on the X in the upper right of the window to exit the program and in about two or three seconds I get the error. Not every time, but frequently. Below are the particulars of the error. Anyone else seeing this? w-u-2-o wrote: Did you delete or rename the specified folder? Thetis 2.6.4 up and running fine on my Windows 10 pro machine and Anan 8000DLE. I did screen shots of my old settings and started from the beginning adding the settings as I went. Thetis 2.6.4 with my 200D (Orion) flashed to F/W version 1.8 has been running smoothly so far with about 3 hours total running time since I upgraded from F/W version 1.7. I have not yet run into the PTT crash issue that Jeff and Gary have observed with the 7000 (Orion MKII) series rigs but I'll be running it hard this morning to see if it shows up. 1. If the frequency that Thetis is parked on at shutdown is on the AM BCB, the next time you start up the "out-of-band" warning pops up and stalls the loading of the program. Not a serious issue but just an observation of a different behavior for Thetis and after you click through it all is fine. The screenshot below shows the error as it has appeared here. 2. I have seen the next behavior mentioned by at least one other but I'll report that I see it here too. After hitting the "Power" button in Thetis the shutdown takes ~8 seconds to complete. This is not a problem for me but just a different behavior from previous versions of Thetis. If it's doing some house-keeping chores and this is part of a normal process it's a non-issue for me. Thanks for all the work on the new firmware and the new software package. It is better than before when it closed and you had no idea that it was shutting down processes. The one issue with it now is it says that Thetis is "not responding". Would be nice just to have a pop up stating it was shutting down.